Tilted Horizons: MotoGP World Champ Nicky Hayden! 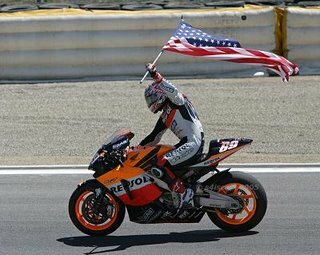 MotoGP World Champ Nicky Hayden! Nicky got a good start while Valentino Rossi got off to a terrible start. I believe Nicky was 2nd and Rossi was running about 6th on about lap 4 when Rossi low-sided in a slow left-hander pressing hard to catch up. Rossi got up and kept going, but ended up 13th. Nicky rode fairly conservatively after Rossi went down and finished 3rd, winning the championship by 5 points. Hayden's championship is the first by an American since 2000 (Kenny Roberts, Jr.) and ends Rossi's amazing streak of 5 straight MotoGP championships.